A Clinton and a Bush are running for president, and Newt Gingrich said he's open to being Speaker of the House again. Hold on to your hats people, because the '90s are absolutely upon us. 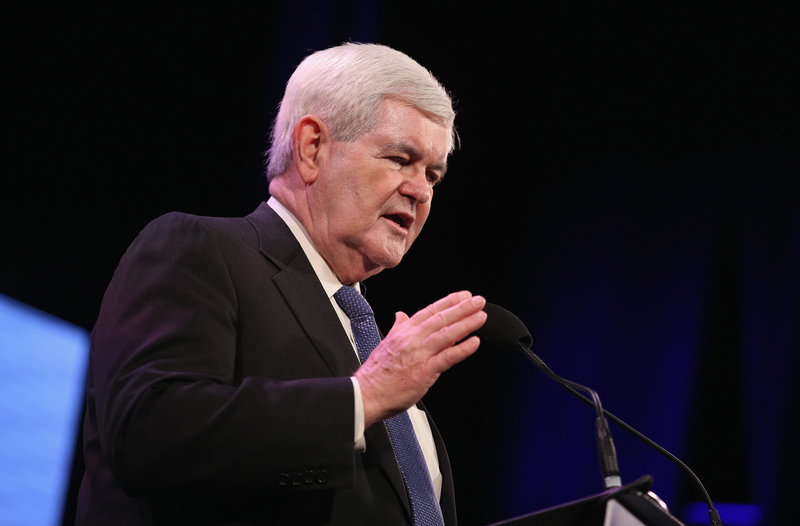 Gingrich's statement came during an interview with Sean Hannity Thursday morning, following the surprising announcement that House Majority Leader Kevin McCarthy had dropped out of the Speaker vote. McCarthy, whom many had assumed would replace current Speaker John Boehner after his upcoming departure on Oct. 30, dropped out of the race. In order to be elected as Speaker, a candidate must succeed in gaining 218 votes — something that McCarthy apparently felt was out of the realm of possibility for him. Although Hannity — who pressed the issue during his interview — might have been serious, Gingrich appeared to be unwilling to seriously consider returning to the position he held from 1995 to 1999. Although Gingrich currently enjoys a level of political celebrity, in the 1990s, he became the first Speaker to be sanctioned and fined by Congress, due to ethics violations. And like Boehner, he resigned from his position among a divided and fractured party. But according to Gingrich, if Congress asked him for help, he would answer the call. "If you were to say to me 218 have called you up and given you their pledge, obviously no citizen could ever turn down that kind of challenge," Gingrich said. "This is why George Washington came out of retirement — because there are moments you can't avoid." But even if 218 members of the House came knocking, could Gingrich — a private citizen, who coincidentally failed to secure the 2012 presidential nomination — actually take up the third most powerful position in the country? The answer is: kind of. Although the Constitution does not require the Speaker of the House to be an elected member of the House of Representatives, no one who wasn't currently serving as a representative has ever been elected to the position. Like much of the Constitution, the meaning and intent of this particular aspect is widely debated, but a non-Representative is highly unlikely to be elected. For the time being, however, Gingrich appears more interested in an advisory position. "What I would say, which would be more practical, is if the House Republican Conference wanted me to be in a position to sit down with them and talk with them and try to help them think this through," Gingrich said. Even if it's a joke, Gingrich's statements cut to the heart of the problem with the current Republican party: They are leaderless, split, and desperately in need of direction. The party has become a circus, with political coups among members blocking productivity. They have no clear, strong leaders — and the Republican candidate currently leading the presidential race is Donald Trump, a man who is not widely respected among the party, and who has turned the 2016 election into a reality TV show. As a result, past party leaders like Gingrich feel the need to step in and fix the problems, effectively saying to party members, "It's okay kids, the adult is here now." The GOP desperately needs a Speaker and party leader who can unify members, but infighting has made it impossible to decisively elect a strong Speaker who can accomplish that job. Currently, Gingrich has about as good a chance as McCarthy in terms of becoming Speaker. But the party needs to find a candidate that they can agree on, and fast — before they fracture irreparably.